Once the first flush of new potatoes have come, and have been enjoyed simply steamed with lashing of butter, I start using them in potato salads. For most of the summer I try to keep a bowl of cooked salad potatoes or potato salad in the fridge. It makes an excellent basis for a meal, simple add some fresh leaves and slices of cooked ham, left over chicken or smoked fish and a simple lunch can be on the table in less than 5 minutes. I do notice just how much mayonnaise we get through in the summer, we do like lots of it on our potato salad so I’ve started substituting half the mayonnaise for 0% fat Greek yoghurt. It halves the fat and; surprisingly, makes virtually no difference to the taste – the perfect fuss free change towards a better diet. 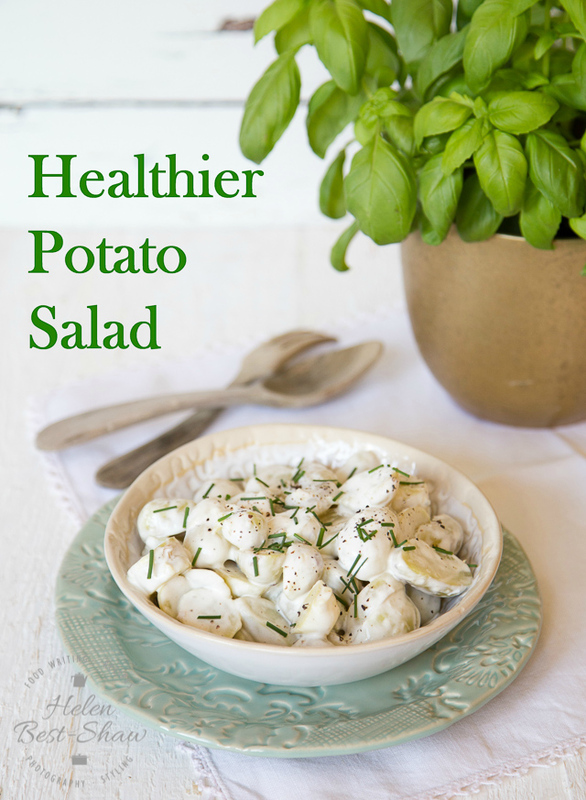 If you try this Healthy Potato Salad – Half Mayo Half Yogurt please tag #FussFreeFlavours on Instagram or Twitter. It is amazing for me when for me when you make one of my recipes and I really do love to see them. You can also share it on my Facebook page. Please pin this recipe to Pinterest too! Thanks for reading Fuss Free Flavours! 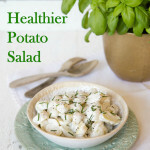 A simple substitution makes this potato salad far more healthy without compromising on taste. Boil the potatoes for about 20 minutes until just cooked - plunge into a pan of cold water to cool. Slice or cut into chunks as you prefer. Place mayonnaise and yoghurt into a bowl and mix with a fork or mini whisk, add enough water to thin. (The mixture should be the consistency of double cream). Season to taste. Add the potatoes in batches, using a gentle folding action to coat them with the dressing. Place in a serving bowl and garnish with the chives. Keeps in the fridge for 3 days. You can use homemade kefir in place of the yogurt.